Tommy Jarvis (Thom Mathews) despite being driven crazy, having family and friends killed, and nearly getting sliced up himself, decides he really needs to disturb the grave of Jason Vorhees. This goes about as well as you would expect. Thanks to a metal pole and some lightning, Jason is back in action. Jason, who is now an unstoppable zombie, punches the hearts out of victims and tears the arms off of paintball enthusiasts. Naturally, the sheriff blames Tommy for the killings. Tommy and a camp counselor named, Megan (Jennifer Cooke), come up with a plan to trap Jason at the bottom of Crystal Lake forever (or at least until Part VII). From opening credits that parody the opening credits of James Bond films, to kills that are deliberately played for grotesque laughs, and a resurrection scene that dares you to take it seriously, this is the tipping point where the Friday the 13th series begins to engage in more and more self-awareness and postmodern humor. It provides a huge infusion of energy in the first half of the film, at least until things settle down into a more of standard series of events. It’s humorous, inventive, and playful in a way that hasn’t really been evident since Part 3. This is also probably the first film in the series where the actors appear to be having fun (Crispin Glover notwithstanding). 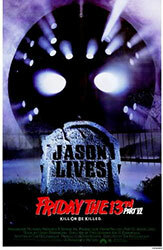 Jason Lives conjures up silliness to sustain the series, but at the cost of the horror.